And actually, even though the embargo has been lifted, I prefer not to rush ahead into Christmas carols and the like, but rather to practice the age-old discipline of advent… Watching and waiting for the coming King, as the prophets did of old… And one of the reasons is, I’m not actually very good at waiting. Approximately once a month I toddle down to Newtownards at an unearthly hour on a Sunday morning to do a stint on their Sunday morning Christian magazine programme, Dawn Reflections, with Vanessa Jones. My role is to comment on the Sunday papers, from a faith perspective, and to do a pre-prepared 3 minute review of the key story or stories in the previous week's news. What follows is, broadly what I said in that review this morning. Bad Bio-Medical Science... Good Gospel? I'd never read one of Ben Goldacre's "Bad Science" column in the Guardian on a Saturday before, but will probably seek it out in future and his blog has now been duly entered in my blogroll. I had been recommended this book, however, by a couple of friends who, I think, saw that I and Dr. Goldacre are of a similar mindset. Nothing sets me off in a "white flecks of foam flying from my mouth" kind of way, as much as the incompetent handling of science in the modern media... Not even the incompetent handling of theology in the modern media, which is almost as bad. in mortal men, who cannot save. the LORD, who remains faithful for ever. He upholds the oppressed and gives food to the hungry. the LORD thwarts the ways of the wicked. The LORD our God reigns for ever, throughout all generations. 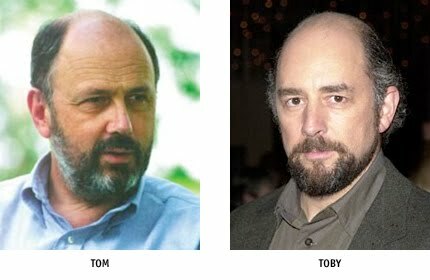 Tom and Toby Separated at Birth? Here's one from Ship of Fools. Have you ever seen Tom Wright, Bishop of Durham and the West Wing's Toby Ziegler in the same room? What's the Point in an Expert Panel? In this time of public finance cutbacks can I suggest a means of saving a lot of money and wasted time and effort? Ditch all the expert panels and commissions that the government has been establishing... funding for various periods of time and then dismissing their findings when they don't think they will be able to sell them to the wider public... Rule No. 1 of being an expert on a government appointed panel... When they want your opinion they will give it to you.